Collection features Steve Lukather, Steve Morse, John Sykes, Doug Aldrich and many more. 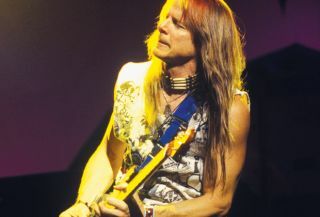 Steve Morse's Prized Custom Buscarino Electric Acoustic Guitar Stolen in Washington, D.C. Always dreamed of getting a bit ofin-person guitar instruction from Steve Vai? Here’s your chance. Deep Purple have premiered the music video for “All I Got Is You,” the second single from their new album, Infinite,which will be released April 7. A spontaneous meeting of guitar greats took place at the Ernie Ball booth during NAMM 2017. Joe Satriani, Paul Gilbert, Tommy Emmanuel and dozens of other guitarists from around the world have put their shred talents together on behalf of fighting prostate cancer and depression.